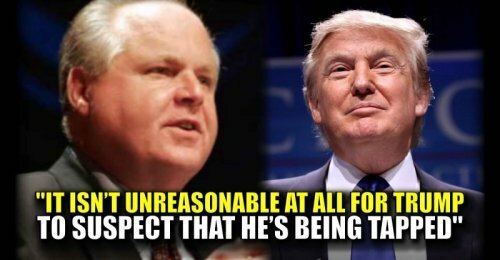 Rush Limbaugh addressed Obama wiretapping Trump Tower on his nationally syndicated radio show, and he stuck close to President Trump’s side, stating that it’s not at all unreasonable for the president to be suspicious. For eight years we heard Obama blame Bush or make accusations against political opponents and NEVER have we heard from the news media that Obama didn't have any evidence. Now, suddenly we're hearing Trump made this accusation without providing any evidence.